The mother of missing student of Jawaharlal Nehru University Najeeb Ahmed on Tuesday met Union Home Minister Rajnath Singh, who assured her of his intervention to find out the youth who has been untraceable since October 15. 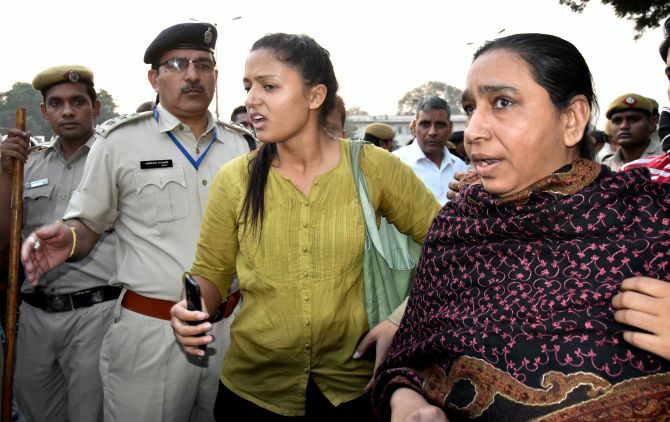 Fatima Nafees and other family members urged the home minister to trace Najeeb, a student of School of Biotechnology in JNU and a native of Badaun in Uttar Pradesh. The home minister gave a patient hearing to Najeeb’s mother and other family mothers and listened to all their grievances, official sources said. Singh told them that Delhi Police has set up a special team to pursue the case and he was personally taking stock of the progress in the probe. The home minister assured the family all kind of assistance, the sources said. Samajwadi Party MP from Badaun Dharmendra Yadav, who accompanied Najeeb’s family, said the home minister has assured them that efforts are being made to trace him at the earliest. “If police are not able to trace him, we will approach court and raise the issue in Parliament,” Yadav told reporters after the meeting. Najeeb’s sister Sadaf rubbished allegations that he was mentally unstable and said efforts are being made to ‘defame’ him instead of tracing him. “He had cracked university exams, he is a studious child. Do you think a person studying at such a prestigious institution can be mentally unstable? I request (all) that please don’t defame him. He had sleeping problems that children who are studying often have due to pressure. He had no other problem,” she said. Najeeb, 27, went missing on October 15 following an on-campus scuffle allegedly with some members of Akhil Bharatiya Vidyarthi Parishad the night before. His mother claimed that she had spoken to Najeeb on the night of brawl and that she was sure that he did not leave the campus on his own. “I spoke to him at 11 pm, he wasn’t depressed. He was waiting for me, he had called me up. He did not go anywhere on his own he has been kidnapped...I am sure about it,” Nafees said. Najeeb's mother was detained on Sunday by police while attempting to take out a protest march to India Gate.